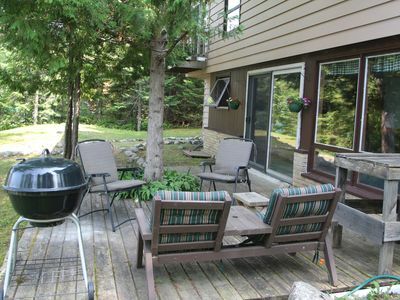 This is a beautiful, secluded property located in a private bay with a sand beach on the west arm of Burntside Lake. 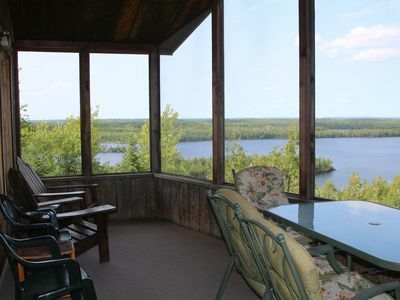 Enjoy solitude with wide open views overlooking the lake, beautiful sunsets, misty mornings without a neighbor in sight. 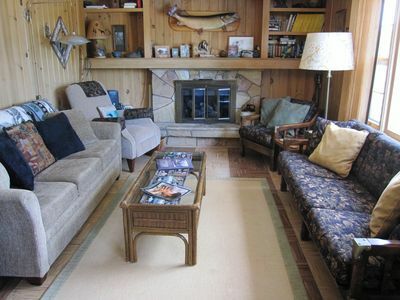 Two log cabins (rented as a single unit, with cabin #1 having a queen bed, bunk bed, and a twin; cabin #2 has a queen bed, two twins, and a full-size futon) sleeping 8-11, with a separate cooking cabin and a separate screened in gazebo right off of the beach. . 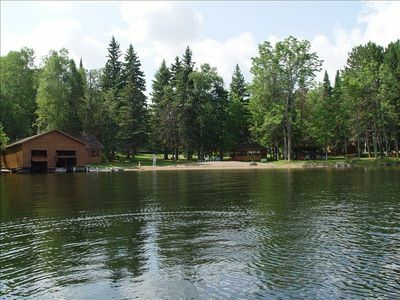 Relax in a spacious sauna then jump in the lake to cool off! Family friendly, kids love the beach. This is one of the few on Burntside with no drop off, perfect for younger children. Bring your boat! 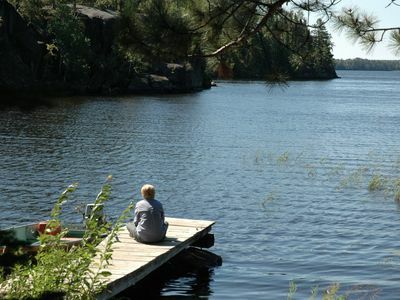 Smaller boats can be tied to our dock, pontoons pulled up to the beach. 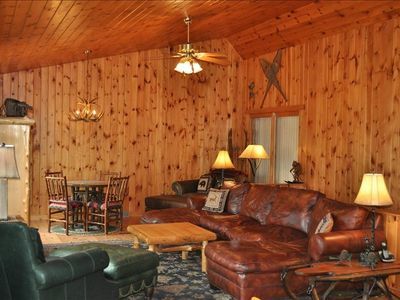 This rental includes 2 log cabins. 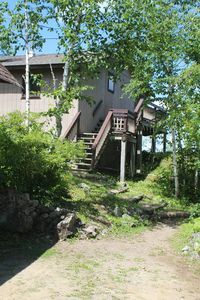 The first is located 20 feet from the beach and is connected to the boat house which houses the sauna. It has 2 bedrooms with a double bed in one and 2 twins in the other. There is a pull out sofa in the main area that can sleep two smaller people or kids for a sleeping capacity of 6. 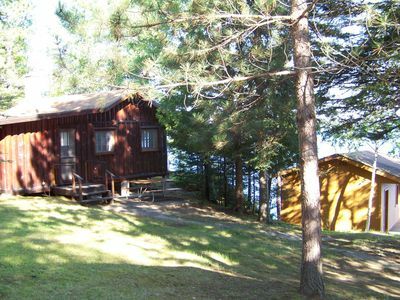 The second log cabin is directly up about 60 feet from the first cabin and has 2 bedrooms with 2 twin beds each for a sleeping capacity of 4. Guest cabins each have a bathroom including shower, toilet, sink and hot water. 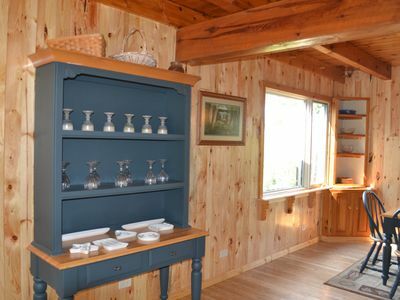 Separate cooking cabin is equipped with a gas oven/stove, refrigerator, microwave, and dishwasher. There is cell coverage in the area for Verizon and AT&T, possibly others, although it gets spotty on the drive back to Ely. Bed linens are supplied, but please bring your own towels. Laundry facilities are available in the Ely. In addition, dogs will be considered on an individual basis with damage deposit, but no pets are preferred. If you are planning on bringing your dog, this needs to be discussed and approved at the time of your booking. 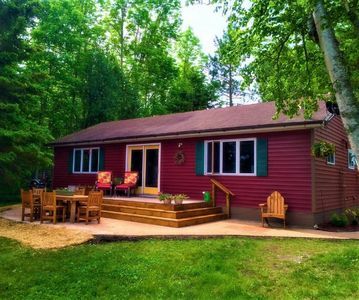 There is a main cabin on the site which is not included in the rental. 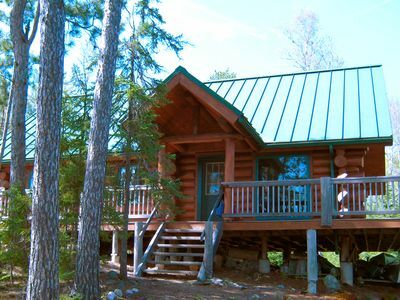 This cabin will not be rented out during your rental period and will remain unoccupied. An advance deposit of $500.00 will secure your reservation. Should you need to cancel your plans, and we are able to rebook the cabins, we will refund the deposit less a 10% service charge. If we are unable to find renters for that week, you will be responsible for the full amount of the original reservation unless you are able to change your reservation to another available week. Starting in 2013, sales tax will be IN ADDITION to the rental fee listed for the property.